(Nanowerk News) Chinese scientists have synthesized new nanowires with high carrier mobility and fast infrared light (IR) response, which could help in high-speed communication. Their findings were published in Nature Communications ("Ultra-fast photodetectors based on high-mobility indium gallium antimonide nanowires"). Scientists from the Institute of Process Engineering (IPE) of the Chinese Academy of Sciences, City University of Hong Kong (CityU) and their collaborators synthesized highly crystalline ternary In0.28Ga0.72S nanowires to demonstrate high carrier mobility and fast IR response. 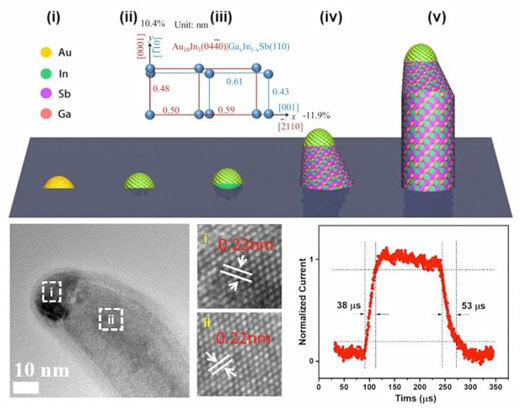 In this study, the In0.28Ga0.72S nanowires (bandgap 0.69 eV) showed a high responsivity of 6000 A/W to IR with high response and decay times of 0.038ms and 0.053ms, respectively, which are some of the best times so far. The fast IR response speed can be attributed to the minimized crystal defects, as also illustrated by a high hole mobility of up to 200 cm2/Vs, according to Prof. Johnny C. Ho from CityU.